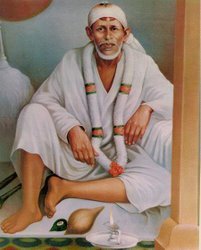 Was reading the post about Shirdi Sai Baba's quote form Shri Sai SatCharitra and a Parable from Gospel of Shri Ramakrishna on Mr. Shastri's blog. Sai Baba clearly indicated that those who injures others not just physically but with thoughts and words they injure Him, as He primates in all living and non living beings. That's the reason going to Temple or doing Worship of Sai Baba and then indulging in any act of hurting any being, with words, thoughts or deed, has little meaning whatsoever. One incident comes to mind is about a devotee. 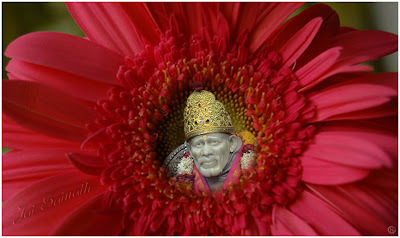 One man had gone to Shirdi with his friend who was devotee of Sai Baba. 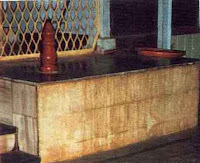 When he went to Dwarkamai along with his friend, there was a great attraction of Baba's divinity over him. 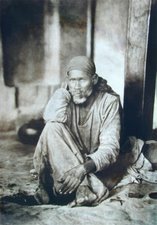 He found himself attracted to the Fakir of Shirdi. The divine love of Baba was taking over his mind, heart and soul. A feeling of serenity love and peace was felt. It made him sit in Dwarkamai and look at the Guru with love. It was difficult for him to take his eyes off the divine form of Sai Baba as it gave immense sense of peace in heart and body. 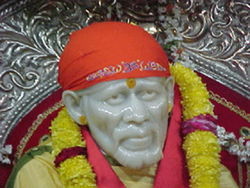 His heart felt thankful towards the friend who was instrumental in bringing him to Shirdi. That was the first attraction that lasted few hours. 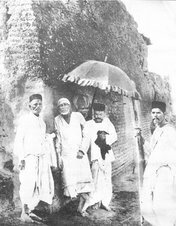 During the short stay in Shirdi, Dwarkamai and Sai Baba was the attraction for him. 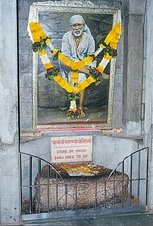 Next day while sitting in Dwarkamai he saw devotees massaging Baba's legs, and a desire arose to get that opportunity for himself. It was granted. 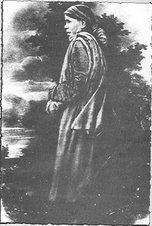 The karmas and the impressions of mind are not easy to go. The conditioning of the mind is not that easy to be freed from. That's the reason for Shraddha (Faith) and Saburi (Patience). Shraddha meaning the Faith was instilled with the experience of the calmness deep within, now it's up to the devotee to meditate and love Sai .Because love includes everything the worship, taking interest in His leelas (divine play as this one we are going through) and thus creating some interest in, letting the self merge in the divine love . Somehow thoughts against some devotees started attacking his mind, while he was doing the charan seva (massaging the legs of a Sadguru, the emitter of Divine love and grace) . At that moment Sai Baba asked him to stop and leave. Perturbed he went to the corner of the sacred and loving Dwarkamai and sat there wondering why he was sent away so quickly. Realization of the mistake that happened dawned on his mind. 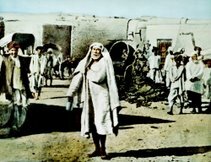 The mind was occupied against someone else's deeds rather than absorbing the divine and serene love that prevailed in the presence of Sai Baba. He mentally asked for the forgiveness for what had happened. Sai Baba immediately called him back, do the charan seva and absorb some divine love that would give him peace. It is the injured and insecure mind that would like to injure others. A mind that is whole, filled with love and compassion would never be attacked with the feeling of injuring others. So not to injure others or even the feeling or thought of not injuring others, deep love for divine is needed. When the mind heart and soul are merged and saturated with the divine love it happens. That's the reason when Jesus Christ was made to go through much sufferings, what came out of him was love. The forgiveness for the ones who were inflicting pain as he knew that they were unaware of the subtleties of what they were doing. That's the reason when Gautam Buddha was attacked by abuses, the abuses did not have the strength to bring about even a little bit of disturbance in the calmness and peace that prevailed his heart and mind. Let's pray to Baba, lets pray to the divine that even our hearts and mind gets saturated by the divine love so much, that nothing would disturb it and nothing would bring about insecurity. Thank you, Alpesh; very nice exposition. Satya Sai Baba says that samadhi means sama-dhi, i.e., being in equanimity irrespective of what happens. Good one to shoot for. alpesh..it was beautiful explanation..even i want to be loving and caring..shraddha and saburi..
A small correction in the text : I hink the following sentence "So not to injure others or even the feeling or thought of injuring others, deep love ... " should read as "So not to injure others or even the feeling or thought of not injuring others, deep love ... "
Thanks Anonymous, have done it. Sometimes missing a word gives a total different meaning to that sentence. 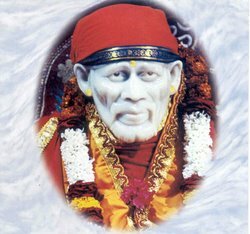 mere baba please help me.Please show me the right path. thanks to the one who gave the tremendous information.